Get 3 Local Solar Quotes – solarquotes.com.au/_3_Best_Quotes – w/ 12,000+ Real Installer Reviews. Save Time & Money Now! Last night’s by-election was a thumping victory for the ALP’s Yvette D’Ath. The result was largely in line with expectations, with the Liberal National government polling much more poorly than they did at the 2012 election, and due to the circumstances of the by-election. These are the figures at the end of election night, including all ordinary booths and prepoll votes. Most outstanding votes will be postal votes. At the time of writing, the ALP’s swing of just over 16% was slightly larger than the swing to the LNP in 2012, putting D’Ath’s result about even with the ALP’s result in the seat in 2009. The result was decisive, but it was hardly a shock result. The result does not necessarily mean that the LNP can’t win the seat in 2015. While governments often reclaim seats they lose at by-elections, Redcliffe is not a blue-ribbon Liberal seat and was held by the ALP prior to the huge landslide in 2012. Having said that, D’Ath’s margin is still quite small after such a large swing, and she will need to strengthen her personal vote to stop any backslide in 2015. There were thirteen booths used on election day. The ALP won ten of these booths, and the LNP won three. The two-party-preferred vote for the ALP peaked at just under 65% in Kippa-Ring. The LNP won a slim majority in Kippa-Ring North and Scarborough North, and a solid 62.8% majority in Bally Cara. The ALP gained double-digit swings at all booths, ranging from 11.3% in Bally Cara and Kippa-Ring North to 22.4% at Kippa-Ring. The outstanding minor candidate was independent Len Thomas, running in opposition to the Newman government’s anti-bikies laws. Thomas polled over 10% of the vote, with his vote peaking at 13.2% in Frawley. The Greens came fourth, with their vote dipping below 4%. The following booth breakdown uses the same booth breakdowns used for the pre-by-election guide. The ALP won solid majorities of 57-60% in three of the four regions. In Scarborough, the LNP held on with a 52% majority, winning two of the three booths in the area. The ALP won the two largest booths in the Scarborough area, but with slim margins. You can also view maps below, showing the two-party-preferred vote by booth and the vote for independent candidate Len Thomas. 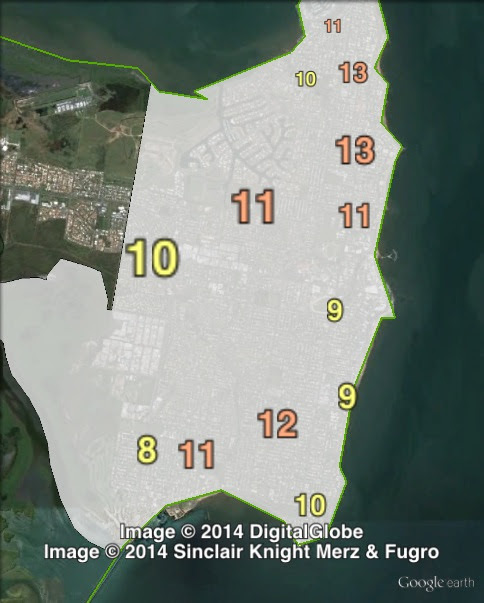 Two-party-preferred votes at the 2014 Redcliffe by-election. 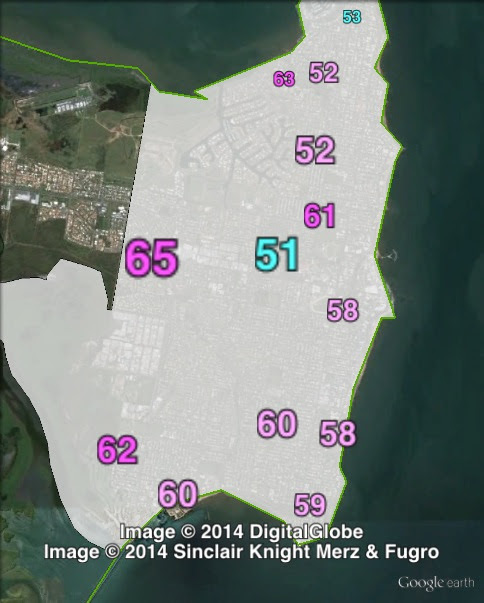 Primary votes for independent candidate Len Thomas at the 2014 Redcliffe by-election.